Steven (Chicagoland, United States) on 23 December 2010 in Architecture and Portfolio. 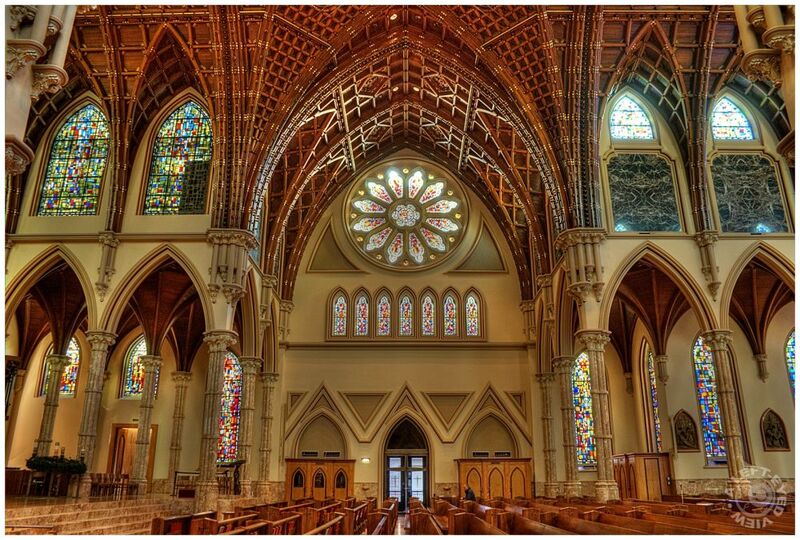 Standing in the transept of Holy Name Cathedral in Chicago, Illinois. I am looking south with the altar to the left. In the distance you can see a lone man kneeling in the pew. Photo captured December 17, 2010. Lovely color, detail and symmetry. Great compo and details . Colors are great, so warm ! The stained glass and the roof vaulting show really well, but it doesn't quite have the impact of the last two posts. I guess their "lines" were killers. De très beaux détails ... Et quelle magnifique lumière. Nice, another lone figure. Starting of course upwards at the stained glass windows I noticed that the ones closer to the alter and before the door are different from the ones toward the back of the sanctuary. Also though.. is that the shadow of a building outside too? A great place! Your photograph gives an exact idea of the vastness of this hall, it is technically brilliant, too. What a awesome shot of such a beautiful place.